Kamal Hasan referees a welterweight bout between Andre Berto (right) and Steve Upsher. In his paid profession as a paralegal and in his side gig as a boxing referee, Kamal Hasan thrives in environments where maintaining order among fierce competitors is imperative. His values of fairness, structure and justice — common threads in boxing and law — is also evidenced by his belief in Islam. Hasan, 60, is a practicing Muslim. Born in Dallas and raised in Cleveland, he was an accomplished amateur boxer who enjoyed a brief career as a professional in the featherweight division. After hanging up the gloves, he worked as a boxing judge before finding his niche as a referee, working primarily in the Ohio area. According to boxrec.com, Hasan has refereed three championship fights since 2001, including an IBF bantamweight world title match between champion Tim Austin and challenger Steve Dotse. (Austin won via 6th-round TKO.) Hasan has also reffed bouts involving former champions Bronco McKart and Frankie Randall — the man who famously handed Julio Cesar Chavez his first professional defeat in 1994. 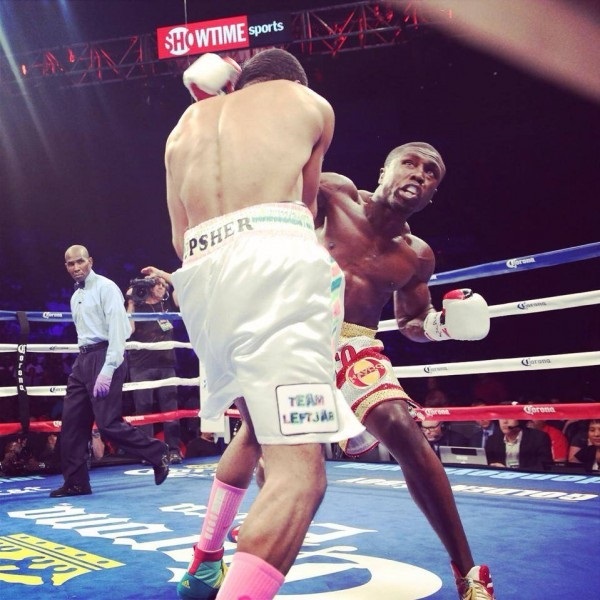 On Sept. 6 of this year, Hasan was the third man in the ring when former welterweight world champ Andre Berto scored a unanimous decision over Steve Upsher, a bout that was televised nationally on Showtime on the undercard of Adrien Broner‘s main-event fight against Emmanuel Taylor. UMMAH SPORTS: During a fight, what is your responsibility as a referee? KAMAL HASAN: My responsibilities are to keep the boxers safe, (maintain) fair play inside the ring and not let a match get away from you. What would you define as a match getting away from you? That’s when the two boxers are doing any and everything in the square and you can’t control it. Do you just referee boxing, or do you do referee other sports like MMA and wrestling? How long have you been a referee? I have been refereeing since I was 18 years old. I learned at the Ohio State Fair years ago. I was told I could do pro bouts, so I checked with Cleveland boxing people and got a license to judge first. I let the commission know I did refereeing also. What are your memories of your boxing career? What is the best or most memorable fight you’ve refereed? The Tim Austin championship match, off the top of my head. I don’t really keep up with it. I just do it. Just like the Showtime fight a few months ago. How do you decide when to stop a fight? Will you give a champion more chances to continue if he’s in trouble? Hell no! The champ, just like the challenger, has got to handle it. The champ gets no extra help or benefit. Over the years, you know what to look for: body language, eyes, balance, composure. I take it all into account (to determine) if I should stop the bout. Is it harder to keep up with faster, smaller fighters in the ring, or to pry apart heavyweights? That depends on the match and how they fight. Sometimes it’s fast with the heavyweights and slow with the lighter weights. Sometimes the boxers follow your instructions and don’t hold. Other times you have to push them off to get them to step back. This is where you show your ability to referee and control the bout. You can get worked in the ring. Have you ever been punched accidentally in the ring while you were refereeing? Yes, I was hit once refereeing an amateur match. Wild beginners, and I was also new at refereeing. From that I learned distance, command and approach to the boxer. You have to be in good physical condition to referee. Do you have a workout regimen? No, I don’t have a regimen. I do work out twice a week, just to keep in some kind of shape for myself. You can’t referee if you’re not in some kind of good shape. The ring lights can be hot at times and if you can’t move under that heat it can be hell on you. Do you watch film of fights you’ve refereed to study your performance? And when you watch fights on TV, are you looking at other refs with a critical eye? I have watched myself and I watch other referees, too. I’ll study what I would do on certain calls or situations. When you go to boxing conventions for organizations like the WBO and IBF, they will discuss these things in detail in question-and-answer sessions. Are there fights you’ve refereed in which you disagreed with the judges’ decision? Yes, more so with amateur matches than professional matches. When you’re in the ring, can you hear the corner men and the crowd? Can you hear the fighters talking to each other? Yes, you can hear everything. I don’t let the boxers talk to each other. They should be trying to box only. What sports do you follow besides boxing? I like basketball and football. I like track, but it’s not popular here in the U.S. like it is in Europe. I love tennis matches. Who were your favorite athletes when you were growing up? My favorite athletes growing up were Muhammad Ali, Willie Mays and Jerry West. Oh, and I can’t forget “The Big O,” Oscar Robertson. Were you raised Muslim or did you convert? I was converted to Islam. Hate brought me to Islam and a better way of thinking about a person just because his skin is not like mine. What about Islam most appeals to you? The caring for each other and the talk of having your own in this land of plenty without breaking the law to get it. Also, the Hajj. If a person can go to one place in his or her lifetime and see all colors of people praising one G-d … I’ve only seen pictures of it, but that must be an awesome sight! Do you have a favorite surah or verse from the Quran? Or just one that you’re particularly feeling right now? I don’t a favorite line, but when I read Quran I do enjoy it. We should want to understand as much and as best we can. Have you ever refereed a match between female boxers? Do you have any issue with that being a Muslim man? Yes, I have refereed female boxers. I don’t like it, but I do my job. I guess it’s just the man in me, but boxing is a rough sport, even for men. So to see two women in the ring is not too hot in my view. Would you referee a fight during Ramadan? Would you have the energy to keep up with the fighters while you’re fasting? Yes, I have done matches during Ramadan. But most of the time, boxing is done after sundown. I can’t remember doing any matches during the daylight hours. I’ve broken my fast with a date and water at a boxing match before. I’ve prayed in the locker room or in a private area and kept moving, thanking G-d for his blessing to enable me to referee.